The internship interview is both an opportunity to highlight your suitability for the internship job and an opportunity for you to assess if there is a good fit between the internship and your career and learning goals. 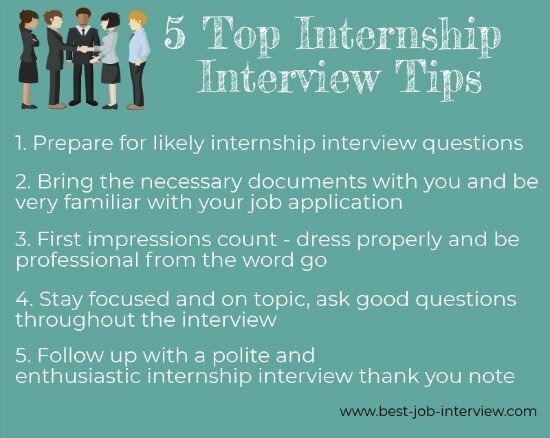 Feel prepared and confident for your internship job search by anticipating the likely internship interview questions you will be asked. Answering these questions confidently and professionally ensures you stand out as an impressive internship job candidate. Generally questions around the knowledge requirements for the internship job can be answered by reviewing your internship resume as they refer directly to your qualifications and training and whatever work experience you have. "Which of your courses or activities has helped prepare you for this internship? "What is your dissertation about and how did you decide on the topic." "What factors did you consider when choosing your major?" "Why did you choose the extracurricular activities you did?" 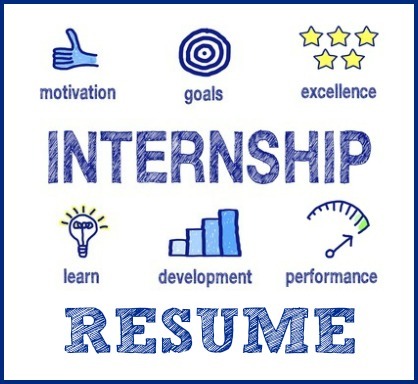 Internship candidates generally lack professional experiences so internship interview questions will focus on the necessary competencies or behaviors for the position rather than work-related questions. Based on the premise that your past performance is the best predictor of your future performance, you will be asked competency-based (behavioral) questions that require you to provide specific examples of when you have previously demonstrated that competency. Outline the results and outcome of your actions. What happened, what was accomplished, what did you learn? Expect internship interview questions that explore these key competencies required for an internship job. "Give me an example of when you have done more than required in a course." "Describe a time you have had to overcome a major obstacle." "Tell me about a time that you improved on an established way of doing something." In your interview answer describe your ability to be proactive, to take imaginative steps to overcome obstacles, generate new ideas, take advantage of opportunities and do more than required. If you have no work experience to draw on, refer to your course, your school activities and your extracurricular and sports participation to find examples. Make sure the example clearly relates to the competency. "Tell me about a situation where you had to do research and analyze the results for a complex assignment." What types of information did you use to choose your school, how did you evaluate it?" "Describe a tough academic decision you had to make, how did you go about this?" "Describe a situation where your initial approach failed and you had to try something different to meet your result." In your interview answer show your ability to gather relevant information and identify issues or problems. Describe how you organized the information, compared data from different sources, considered alternatives and identified the most appropriate course of action taking into consideration your resources and any constraints. "Tell me about a time you had a particularly heavy course load, how did you manage your time?" "Describe how you have balanced your academic work with your extracurricular activities." "What objectives have you set for this year, what steps have you taken to ensure that you are on track?" In your interview answer show your ability to plan ahead, determine priorities, establish schedules and manage deadlines. Describe how you have effectively managed competing priorities, multi-tasked and achieved the necessary outcomes. The internship interview will explore your ability to learn quickly and willingly. "Give an example of when you were able to learn something complex in a short period of time." "Describe a time when you felt overwhelmed on a project or assignment. How did you deal with it?" "Tell me about recent feedback you received from a teacher or supervisor. What did you do with this knowledge?" In your interview answer show you are able to assimilate and apply new information or knowledge in a timely manner. Indicate your high level of interest in learning and your resourcefulness and innovative ability in acquiring knowledge. Include your attempts at self-improvement. "Tell me about a situation when you had to work with other students to achieve an objective." "Give me an example of when you had to gain cooperation from someone who was being difficult." "Describe a group project of which you are particularly proud, what was your contribution?" In your interview answer describe how you have worked effectively as part of a team or group to reach an objective, your ability to respect the needs and demands of other team members and to make a valuable contribution. If you have no work experience you can refer to group assignments or projects, team sporting activities and community work you may have been involved in. "Tell me about the course that has given you the most problems. How have you handled it?" "As a student how did you define good performance? Give me an example of when you achieved this." The employer will explore your motivation for this internship. "What do you expect to gain from this internship?" In your interview answer focus on the skills you will learn and how they will benefit you going forward. Explain the value of applying your theoretical knowledge in a real work situation. Highlight the job competencies you will develop and how you will implement these in your future career. 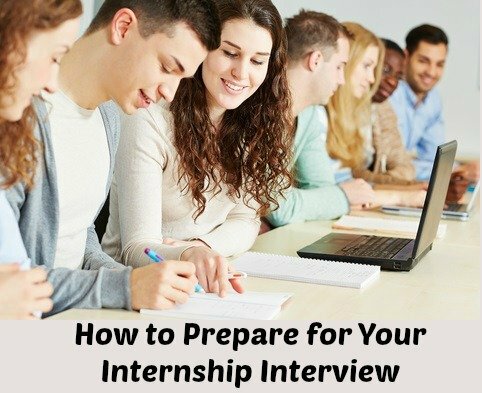 This interview is the final step to being accepted for your internship, put the effort into preparing properly for it and you are on your way to success. We answer your questions about internship job interviews at internship interview tips. How to dress for internship job interviews on a limited budget and with a limited working wardrobe. Have a list of good questions ready to ask in your internship interview. "Could you describe the tasks and assignments I will be involved in?" "Who are the people I will be working with?" "Is there an orientation program in place?" Go to the list of questions to ask the interviewer for examples of good questions to ask your interviewer. Use this sample internship interview thank you letter to follow up after the interview.